Cumin, a spice that originated in Egypt, has been a part of the cuisines of the Middle East and India for thousands of years. This little seed, a standard flavor in curries, may also have medicinal properties, although to date most research has been on animals, not humans. You can buy cumin seeds whole and crush them with a mortar and pestle, or purchase ground cumin at most supermarkets. A study by researchers at Mysore University in India explored the potential anti-diabetic properties of cumin. In this study, published in 1998 in the journal "Nutrition Research," the research team fed diabetes-induced rats a diet of 1.25 percent ground cumin for eight weeks with positive results. The rats experienced a reduction in hypoglycemia, or low blood sugar -- a condition common in diabetics -- and glucosuria, in which the urine contains too much glucose. A review of scientific studies published in 2005 in the "International Journal of Food Science and Nutrition" confirmed that a number of spices, including cumin, may aid hypoglycemia. Talk to your doctor about using cumin for blood sugar control. Although this flavorful spice has a long history as a treatment for indigestion in Indian households, medical research has just begun to suggest the benefits of cumin to the digestive system. A study on rats by researchers at Mysore University, published in the "Indian Journal of Medical Research" in 2004, found cumin useful for both dyspepsia and diarrhea. 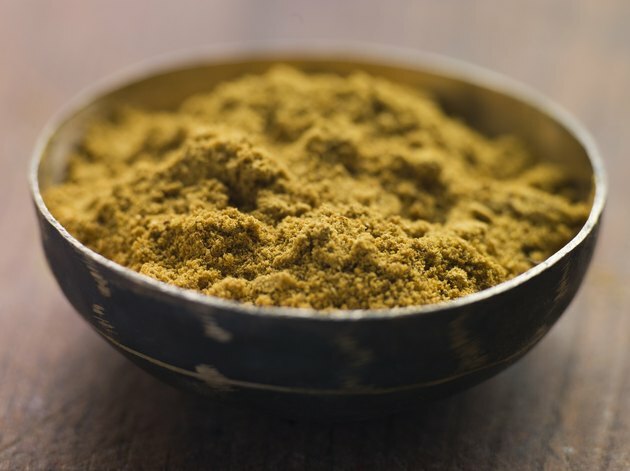 The spice appears to stimulate the liver to secrete more bile, which aids in the breakdown of fats and the absorption of nutrients, leading to healthier digestion. In the study, cumin increased bile secretion in the rats by 71 percent. Cumin seed is a source of the essential mineral magnesium, which the body cannot produce, and therefore must get through diet. A tablespoon of cumin will give you 6 percent of the recommended daily value of magnesium for adults. Magnesium serves a host of functions, including promoting heart health, controlling blood pressure and aiding the absorption of calcium. Cumin is also an excellent source of the essential mineral iron, with just 1 tablespoon supplying 20 percent of the daily value. Your body needs iron to carry oxygen to all its cells. Michael Murray, N.D., author of "The Encyclopedia of Healing Foods," recommends purchasing organic cumin, as most spices are irradiated -- treated with radioactive materials to extend shelf life. He also suggests purchasing cumin seeds instead of buying this spice already ground, since ground cumin loses its flavor more quickly than do whole seeds. Store your ground or whole-seed cumin in a cool, dry place to help it retain its nutrients. Murray says that ground cumin stays fresh for about six months, while cumin seeds last about a year. Before you grind your cumin seeds, lightly roast them for a few minutes at 300 degrees Fahrenheit or in a hot skillet.